Need a treat at the end of a long day but not a fan of the guilt that comes with indulging? Dark chocolate is the answer. Get inspired with these recipe ideas and let yourself finally enjoy everything about dessert. There’s no denying that dark chocolate is a source of fat and sugar, but it also has some incredible health properties that are lacking in other sweet treats. The cocoa bean is a source of many vitamins and essential minerals and also contains several antioxidants. So, if you’re going to indulge, this is definitely the way to do it! With all the allergies and food restrictions out there today, it can seem next to impossible to create a dessert that everyone can enjoy. Fortunately, there are brands of dark chocolate out there that are gluten-free, dairy-free and nut-free, so everyone can dig in. 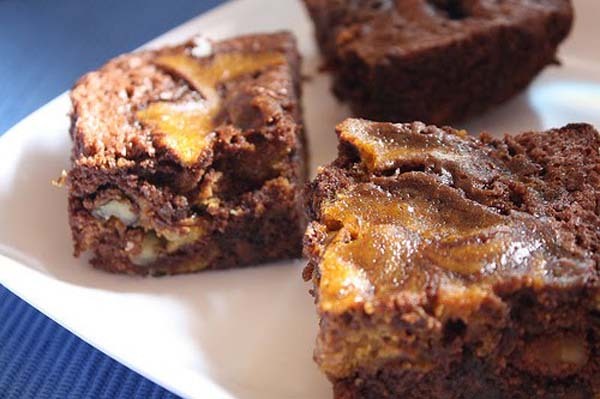 You can be the hit of the party with a batch of dark chocolate pumpkin brownies. Dark chocolate in the 70 per cent range is just sweet enough to satisfy your craving but not so sweet that you’ll feel the need to down the whole batch of baked goods. So, instead of adding multiple cups of sugar, you can simply mix in healthy ingredients for added flavour and be done. For example, create a cranberry pistachio dark chocolate bark that only requires three ingredients. It’s a great sweet treat and good for you, too! Ever considered putting beans or seeds in your dessert? Probably not. It doesn’t sound particularly appealing in theory, but with a little bit of dark chocolate, these quirky ingredients can be delicious dessert additions. Cityline’s black bean brownies are so healthy they could practically be considered a meal! So you can get some food value along with your sweet treat. Thought chocolate was just for dessert? Think again. Store-bought chocolate spreads offer very little nutritional value and are loaded with preservatives. So if you crave that chocolate taste in the morning, try EatingWell’s grilled dark chocolate sandwich to get your day started off right. Or, if you’re looking for a quick snack to grab on the go or a treat to accompany tea with the girls, consider making WholeLiving’s double dark-chocolate and ginger biscotti. As healthy as dark chocolate is, moderation is still important. The slight bitterness in it should help with that, but portion control is still something to keep in mind. It’s also a good idea to take a look at the rest of the ingredients in a recipe before you dive in. If it requires a lot of sugar or calls for heavy cream you should either make substitutions or steer clear all together. Fortunately, dark chocolate is good for you and tastes great on its own, so there’s no need to muck it up with too many unhealthy additives. Plus, with these healthy recipes you should be well on your way to creating a collection of dark chocolate recipes that’s all your own!